A pathway for cancer patients to connect with others battling the disease can now start in the palm of their hands. 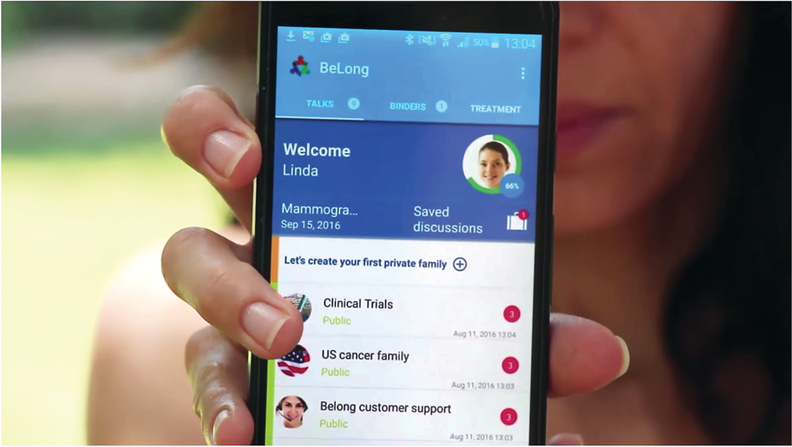 Belong, a free patient navigation app, is a platform for cancer patients to explore ways to improve the quality of their lives. Advocacy groups such as American Cancer Society and Colorectal Cancer Canada also use the app to engage with patients. "When we established Belong, we wanted to be the GPS, the way for cancer patients to make fewer mistakes and improve quality of life," Belong CEO Eliran Malki said during an interview at HIMSS 2018. Malki, along with two other entrepreneurs, launched the app in 2015 after each of them lost relatives to cancer. It's easy to become a "Belonger." You can download the app and choose a username, without having to disclose your real name. The app uses proprietary machine learning and AI technologies to personalize the experience for every patient. Belongers can share info, connect with clinicians and detail their treatment progress. "I'm overwhelmed by the powerful and meaningful emotional support Belongers constantly provide to one another, and the profound impact of the connections made in our community," Malki told USA Weekly.